This is my second entry for the weekly challenge of treasure, the first entry can be seen at Treasure. 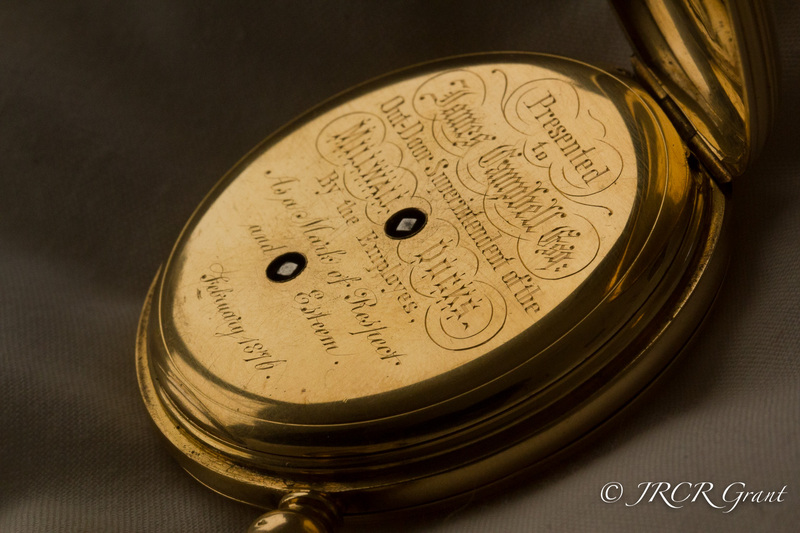 The pocket watch below may be worth little in hard currency but as an heirloom is priceless. Opening up the back of the case we find an inscription, showing the clock to have been presented to James Campbell in 1876 (my paternal grandmother was a Campbell). So this little treasure has now been in the family almost 140 years. Irreplaceable. The watch itself is full of craftsmanship with intricate small working parts, made in London by Chaplin & Sons of 25 Aldersgate. I couldn’t resist a few more shots of this wonderful old time piece and hope you appreciate them too. Beautiful priceless treasure, you really captured it intricately. Such a beautiful object, and the family story makes it even better! Great photos too, really capture the ‘treasure’ feel. What a great treasure. Wonderful images Mick ! Beautiful series. I especially like “Crafted” and “time to reflect”. ah ha! I was correct… It’s not just about the passage of time; it’s the links to family ties that matter. Gorgeous pictures for a gorgeous time piece. A fabulous timepiece – does it still keep good time? Wow!! I just love these photos! Real treasure you have! An example of fine craftsmanship from long ago….does it still work? You did a great job photographing this watch and showing us its preciousness. I’m showing this post to my husband. He’s a watch collector. They are wonderful shots MM! I have a pocket watch my great grandfather had. I should take some shots of it. Although I don’t do close up work and don’t even own a macro lens, but it would be fun to try. Thank you for sharing these wonderful shots!